The Anatomy of Carpenter Ants, also called Wood Ants. The Very Large Ants of Genus Camponotus. The Anatomy of Carpenter Ants, also called Wood Ants. The Very large ants of Genus Campotonus. 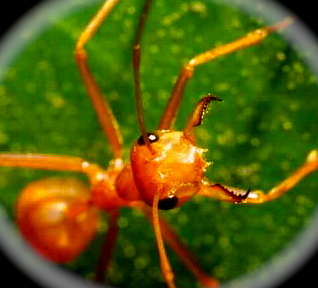 View ant videos and ant photos. Search Terms: Large Ants; Ant Types; Ant Species; Carpenter Ants; Family: Formicidae; Genus: Camponotus; Wood Ants; Ant Videos. Carpenter Ants are large ants. Also called Wood Ants, they belong to the taxonomic Genus Camponotus, the largest genus of ants under the Family, Formicidae. Although most Camponotus species escavate their nests in wood, they are unable to digest wood cellulose and, unlike termites, do not eat wood. Genus Camponotus contains 600 species of large ants, 43 of which are found through out North America (MidAtlanticIPM, 2007). Their habitats range from sea-level to 9,000 feet. 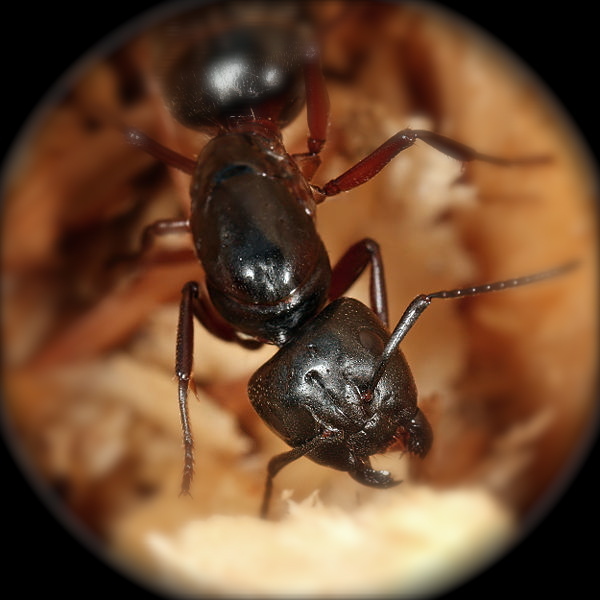 For in-depth discussion of Myrmecology: Ant Taxonomy & Classification; Formicidae (ant) Colony Behaviors; Anatomy, Physiology, Life Cycle (complete metamorphosis), Colony Caste System and great, relevant ant videos click here. Carpenter Ant Anatomy.......Identification Made Easy - Key Points. Anatomical Differences Between Winged Carpenter Ants & Termites . Mature adult workers can be red, black or brown - however, variations of these colors are not uncommon. Overall size range is species dependant. Queens of the species are larger and workers of established colonies exhibit polymorphism - size variation among workers. Note the ant in the photo to the left. It is a classic example of the Black Carpenter Ant (species C. pennsylvanicus) that inhabits the eastern United States. Of ant types, this is perhaps the largest species in Genus Camponotus. Some winged queens have measured as large as 1" (Hahn, Cannon & Ascerno, 2002). Closer discrimination of the photo reveals: overall, dull black color with lighter, yellow/brown hairs on its gaster, a rounded, smooth convex thorax, narrow waist (petiole) and one, small nodal protrusion, just anterior to its gaster. Antennas exhibit characteristic "elbow" bends, devoid of "bulbs or clubbing" at their ends. All distal legs are dark reddish in color. Note, Carpenter Ants have no posterior "stinger". Although unequipped to sting, Carpenter's will bite if threatened. Using their strong mandibles to grab and hold their prey, they spray formic acid directly into the bite wound from a gland located at the end of their abdomen. Although formic acid from a single ant is not poisonous, many ants attacking together can can overcome and mortally wound small insect prey. For human's, Carpenter Ant bites are not poisonous unless the individual has a severe allergy to formic acid, which is rare. 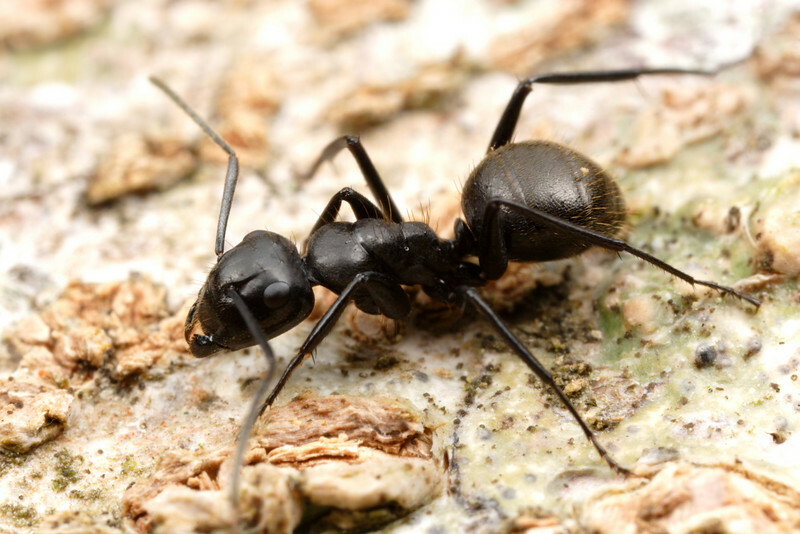 When bitten, in addition to pain from the bite, it is usual for one to feel short-lived "stinging" or "burning" sensations due to the spray of formic acid from the ant (or ants) directly into the bite wounds. Bite wounds should be washed well with soap and water and then covered with a thin film of antibiotic cream. If stings remain bothersome, which in many cases they do, after washing apply a thick paste of bicarbonate of soda (baking soda) over the affected area. 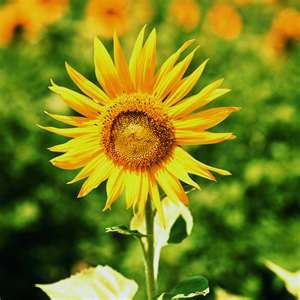 This neutralizes the formic acid and relieves the sting and burning sensations. Identifications are made using mature adults. Overall body size of Carpenter Ants is generally not a good indicator for identification because body size varies significantly across and within species. 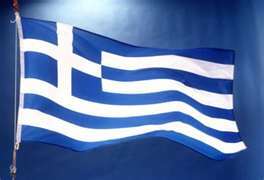 However, the identification of polymorphism, caste size variation, is. This is well demonstrated among the workers of the Black Carpenter ant (species: C. pennsylvanicus), which range in size from 1/4" to 1/2" within the same colony; and the workers of the New York Carpenter ant (species: C. novaboracensi), which range in size from 3/16" to 3/8" within their same colony. These caste size variations are due to major sub classifications within the Carpenter's "worker" cast where minor, intermediate, and major workers all exhibit different body sizes. Major anatominical indicators single out Carpenter Ants (wood ants) from other species of large ants. These can be seen clearly in Fig.2 (left) and Fig.1 photo (above). 1. The top of the thorax is evenly rounded, convex and bears no spines. 2. The attachment between the thorax and abdomen (petiole) forms a "waist" with one protruding node. 3. Camponotus species are polymorphic. 4. No ending "bulb" or "club" on their antennae. 5. Antennae: Characteristic "elbow bend" with 12 segments. 6. Hairs are present on gaster. There is no posterior stinger. 7. Sizes in a colony range from 6mm for minor workers, to 18mm for winged reproductives and as large as 20mm for the functional wingless, colony queen. Size varies between species - thus overall body size is not a good identification indicator, but identification of polymorphism within the colony is (see #3 above). 8. 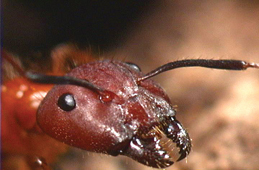 Winged Carpenter Ants can resemble winged termites. Find out how to tell the difference, below. 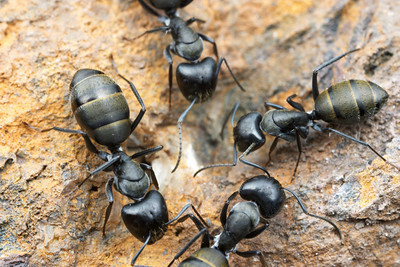 Carpenter ants have dark bodies, narrow waists and elbowed antennae. Front and hind wings are not alike. Hind wings are shorter, often different in shape and exhibit few vein patterns. When wings detach, there are no wing stubs. Carpenters can be seen flying about in the open, during daylight. Conversely, Termites are light in color, have no waist constriction, antennae are not elbowed, and wing stubs are present when wings detach. Front and rear wings are similar in size, shape and vein patterns. Many small veins are present. Front and rear wings are equal in length. Termites do not like light. They avoid light and prefer not to venture far from their colony. Signs of.Indoor Infestation....Eradication ......Prevention & Ant Control. Kingdom: Animalia, Phylum: Arthropoda, Subphylum: Hexapoda, Class: Insecta, Subclass: Pterygota, Infraclass: Neoptera, Order: Hymenoptera, Suborder: Apocrita, Infraorder: Aculeata, Superfamily: Vespoidea, Family: Formicidae Genus: Camponotus (ITIS, 2006). "Arthropoda". The Integrated Taxonomic Information System (ITIS). ©2008 on Integrated Taxonomic Index Information System Online Database. "Carpenter Ant". 1999. Field Guide to Texas Insects by Drees, B.M. and John Jackman, Gulf Publishing Co. Houston, Tx. ; Reprinted online by Texas A&M University Department of Entomology © 2008. "Carpenter Ant". Western Pest Services. "Carpenter Ants". Mid Atlantic Integrated Pest Management. "Pest Control". Do It Yourself Pest Control. ©2006 Do It Yourself Pest Control. 2009 Dec. retrieved.< http://antcontrols.com/carp.htm> . Gold R.; Glenn G; Brown W. 1999. "Carpenter Ants". Texas Agricultural Extension Service; © Texas A&M University Department of Entomology. Accessed December 28, 2008 at: <http://insects.tamu.edu/extension/publications/epubs/e-412.cfm>. Hahn J.; Cannon, C.; Ascerno, M. 2002. "Carpenter Ants". "Types of Ants: Carpenter Ants". The Ant Institute Online. Vail, Karen M. 2006. "Carpenter Ants". UT Extension Website PB 1599. Pararas-Carayannis, Carolyn (2008). 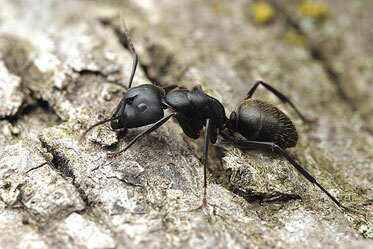 Carpenter Ants (Wood Ants): The Large Ant Species of Genus Camponotus - Anatomy. Info-Now.Org Website: http://info-now.org/ants/AntSpeciesCarpenter-Behaviors.php . Carpenter Ants (Wood Ants): The Large Ants of Genus Camponotus - Anatomy by Carolyn Pararas-Carayannis. Educational, informative article with high-definition photos. The second in a three part series (#1-introduction, #2-anatomy, #3-behaviors) about Carpenter Ants, often called "Wood Ants", Genus Camponotus.